Ready to go for the season at a bargain price!! This boat would make the perfect starter cruiser for a couple or a small family. Excellent value at a budget price! Very strong and stable family yacht. 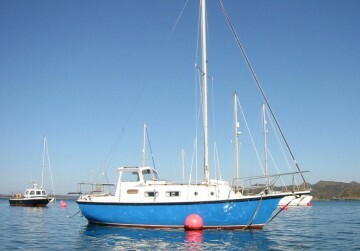 Two owners from new, including former RYA Yachtmaster and sailing instructor. She has been sailed to Ireland, Holland, most of the West of Scotland including the Firth of Clyde, around the Mull of Kintyre many times, through the Corryvreckan many times, Staffa, Iona, Mull, Jura, Islay etc etc. Ideal for that cruising couple or small family. The owners have fully refurbished her over the last few of years, including a beautifully built new doghouse and new 20 hp Beta Diesel engine. Designed by Kenneth Evans for ColvicCraft, the Springtide 25 is the long keeled version of the almost identical triple keeled 24. This boat feels amazingly spacious for its 25 feet giving comfortable accommodation in two cabins. She comfortably cruises at 5.5 knots and goes faster in a blow, taking the weather in her stride. 2 cabins, 2 quarter berths in main cabin and 2 in forward cabin, heads compartment. Nearly new inflatable tender and new lifejackets are available by negotiation. Tyker has given us many years of pleasure. We have spent many happy hours exploring coves and bays, watched dolphins in the Sound of Jura, deer swimming off Scarba, whales off Ardnamurchan, gannets diving off Ailsa Craig, Puffins on Staffa, tourists on Ballymory (aka Tobermory). The best way to enjoy Scotland is undoubtedly by boat. We have sailed with Dolphins, anchored in remote beautiful locations and watched the sunset at anchor. I would say Tyker is ideal for a couple, small family or single sailor.